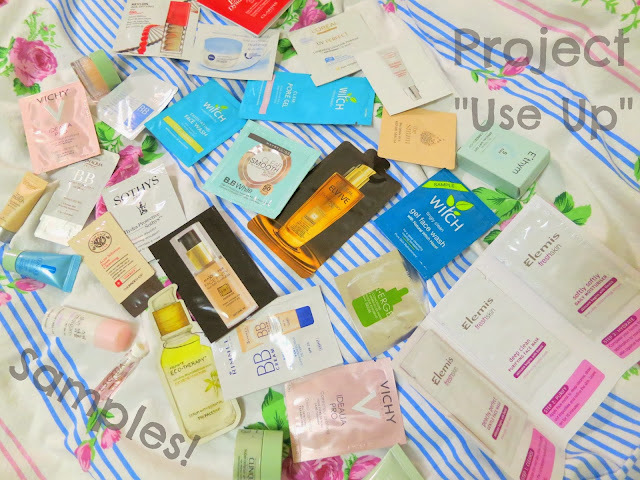 Beautee Beauty | Malaysian Beauty Blog: New Beautee Series: Project ''Use Up Samples''! New Beautee Series: Project ''Use Up Samples''! Everyone loves receiving free beauty samples, don't they? I know I do. I happily collect samples from magazines, beauty counters, PR samples and samples given with purchases with the eagerness and fervour similar to a squirrel collecting nuts for winter. Hehe! I love samples because they are a great way to try out a product before committing to purchasing the full-size. They are great for bringing along on travels too! However, I have amassed way too many samples, and so I have decided to start a new series on my blog called Project ''Use Up Samples''. In this series of mine, I hope to write little, mini-reviews of the products I have sampled and to give you my first impressions on them. This will also help me to (hopefully) prevent from spending on beauty products as I use up the little samples and also to finish up all the products in my not-so-little sample stash. I am really excited to begin this series and I hope you will join me on my journey as I finish up my samples and share my views on them with you! Do look forward to reading my Project ''Use Up Samples'' reviews as much as I am looking forward to writing them! Wow, thats alot of samples. do you get them from different shop or do you get them online?? I know the feeling - all the best using them up! I have a ton of samples as well! I actually went through a bunch of mine yesterday, and I have the same The Face Shop serum lying around. What bothers me is I have no idea how old the different samples are, so I don't know which ones are worth testing out anymore. ahh!! Glad to hear you went through some of your samples- it feels like an achievement for me! =D I know what you mean, I think some of my samples must be outdated too. =S Thanks for the follow!